Warmth in Meeting: New Combo In Politics? 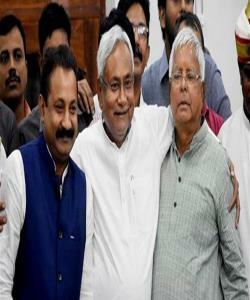 Last year, RJD and JD(U) parted ways. JD (U) formed the state government with BJP sans RJD. Since then, the relations between two have become sour. A lot of things were said and heard, Lalu Prasad went to jail, and now on a six-week payroll, and on a bad health. And, to perform the wedding of his son. Sources smell that some thing has gone wrong in the relation between BJP and JD(U), which might be the reason why Ramvilas Paswan came close to the Chief Minister of Bihar and it is likely that Kushwahaji crossed the bridge. If this is any indication of future politics in Bihar, then the warmth with which Lalu ji greeted Nitish Kumar also speaks of something, which is likely to come out after some time. It is surely an indication of BJP’s future in Bihar.